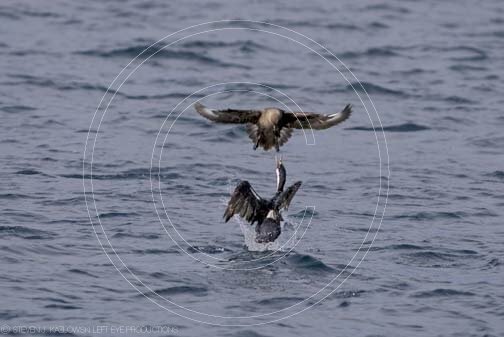 klepto-parasitic feeding between a brown skua, Catharacta Antarctica, and a Blue-Eyed Shag, Phalacrocorax atriceps, or Cormorant, off the western Antarctic Peninsula, Southern Ocean brown skua, antarctic skua, predator, blue-eyed shag, shag, cormorant, aves, bird, seabird, animal, wildlife, fauna, carnivore, antarctic peninsula, antarctica, southern ocean, ocean, water, feeding, eating, stealing, horizontal, gallerythree, © Copyright Steven J Kazlowski & Left Eye Productions. Images included in this database are protected under national and international copyright laws. Images may be used for comping purposes only and remain the property of Steven J Kazlowski and Left Eye Productions until authorised for use by purchase. Terms and conditions may apply.